The ARU Christmas hamper is looking full! Bill Pulver – aka ARU Santa Claus – has delivered a full Christmas stocking to the ARU faithful. At a grass roots level, the Junior Rugby Gold Cup is being implemented. Queensland: Brisbane (four), Gold Coast, Darling Downs, Sunshine Coast, CentralQueensland, Townsville, Cairns. NSW: Sydney (four), Western NSW, Illawarra, Central Coast, Hunter, Northern Inland, North Coast. Teams are also being drawn from ACT, WA, SA and Victoria. The mooted NRC is an eight to 10 team competition with sides from geographical regions throughout Australia being represented. Regardless of the final competition format or the issues of sponsorship, the fact it is being pursued is a positive step in building a sustainable flow of rugby talent through to Super Rugby and beyond. Most were surprised at the timing of the changeover of coaches, which – in hindsight – has proven to be a master stroke. After initial ‘teething problems’, McKenzie has stamped his authority on the Wallabies, who are playing running rugby and inspiring us all on the way. ‘Link’ is building an admirable team culture, which bodes well for 2014 and the upcoming Rugby World Cup. He is proving yet again that successful coaching is also about adroit people management. This was a brave move – especially railing against the views of many that the money used to invest in rugby league players could be better used elsewhere. Izzy has been a sensation. His humble, team-oriented approach combined with quite extraordinary skills have proven to be a marketing masterstroke. Izzy has become the public face of rugby and is obviously very happy playing the game. The game of rugby and Israel Folau are sitting well together. 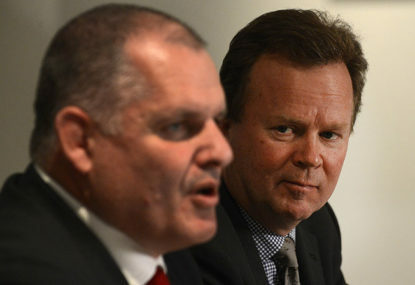 Bill Pulver has presented as a man with a vision and is delivering on that vision. He has been a breath of fresh air after the banker (I’ve got it – you try and get it) mentality of his predecessor. His enthusiasm presents as an excellent go forward/can do example for all to follow. Australian rugby is in good hands. Merry Christmas Bill and thanks for the pressies!